Thinking Child are celebrating all TAs in the lead up to UNISON’s ‘Stars in our Schools Day’ later this month. They have put together a wonderful prize for a special Teaching Assistant and want YOU to nominate. Simply give the name of your chosen TA, their school and the reason why you think they deserve to be the ‘TA of the Year’. The winner will be announced on the 28th November, so please nominate as soon as you can. a large tin of biscuits! 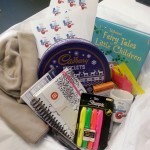 a Training Literacy Day (worth £1,000) for their school!